Ottawa – December 5, 2018 – Canada’s food workers’ union is joining other civil society voices in calling on the federal government for action and leadership on food policy. SEND A LETTER CALLING FOR ACTION! Since 2015, when the government first committed to creating a National Food Policy, UFCW has served as the voice of food workers in the consultation process, demanding that food workers must have a central role in developing the priorities for Canada’s food system. And now, three years later, UFCW joins other organizations from the food and civil society movement in calling on the federal government to exercise leadership, from the top, to deliver A Food Policy for Canada that champions the interests of all Canadians. Trades unions are a central part of civil society, and the voice of food workers must have a strong and meaningful place in the creation and governance of Canada’s National Food Policy. 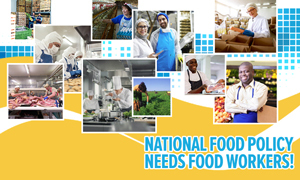 UFCW Canada is calling on all members, activists and allies to support the demand for action in creating a National Food Policy that puts Canadians first! SEND A LETTER to Federal Minister of Agriculture and Agri-Food Marie-Claude Bibeau calling for action.